A large amount of dead fish washed up Friday in Baytown, but Texas Parks and Wildlife Department officials say there is nothing to worry about. BAYTOWN, TX (KTRK) -- Thousands of dead fish are washing up in one Baytown neighborhood, leaving behind a stink of a mess. The fish are in the canals that fork off Burnet Bay. Eyewitness News found tens of thousands of in the canals behind the homes on Yaupon and Rue Oleans in the Lakewood subdivision. Thousands of rotting, dead fish are filling canals behind homes in the Lakewood subdivision of Baytown. A homeowner who lives along the waterway says she first spotted several dead fish early in the morning. When she came back from work in the afternoon, there were thousands of them beginning to rot under the hot Houston sun. Eyewitness News reached out to Texas Parks and Wildlife. They tell us this is a seasonal issue that is common in many canal subdivisions due to low levels of oxygen in the water. High temperatures and algae blooms typically cause this. "The kills typically happen overnight when much of the algae dies off and also produces less oxygen," regional biologist Steven Mitchell explained. "These fish are juvenile Gulf Menhaden that gather in large schools and are drawn to these inland canals to feed on the algae and are very sensitive to environmental stresses." Mitchell says as the fish die, even more oxygen is removed from the water due to the decomposition process. That in turn causes even more fish to die. "This large die off may in turn affect other species of fish if low dissolved oxygen persists day and night for several days," said Mitchell. "The event usually lasts a few days until weather conditions change." Local birds and other animals in the water, like larger fish and crabs, will generally take care of most of the dead fish. 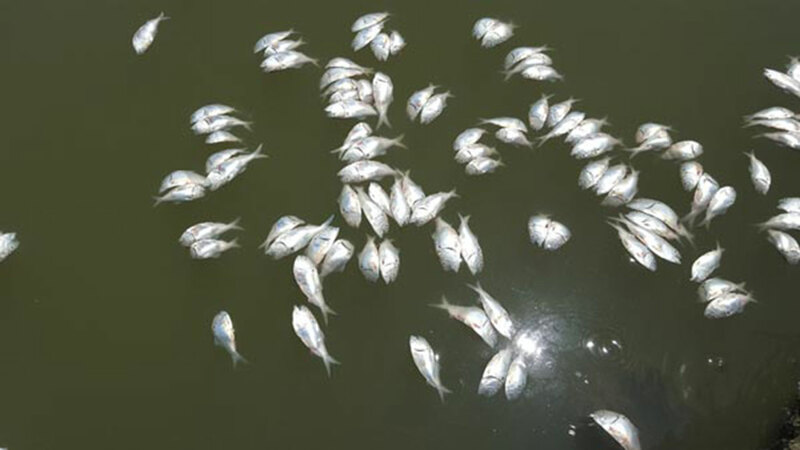 A similar dead fish event happened last May in the Kemah-Seabrook area. It took several days for the stinky, dead fish to disappear.